Order your own copy of the Æmber Wonderland Playmat online through our website today! Competing with other Archons to open the Vaults of the Crucible can lead to untold riches, but taking the time to have some holiday fun can be its own reward! Bring holiday cheer to your tabletop with the Æmber Wonderland Playmat from Fantasy Flight Games, available now for a limited time exclusively through our website! This playmat is the perfect gift for any Archon looking to keep their games organized. 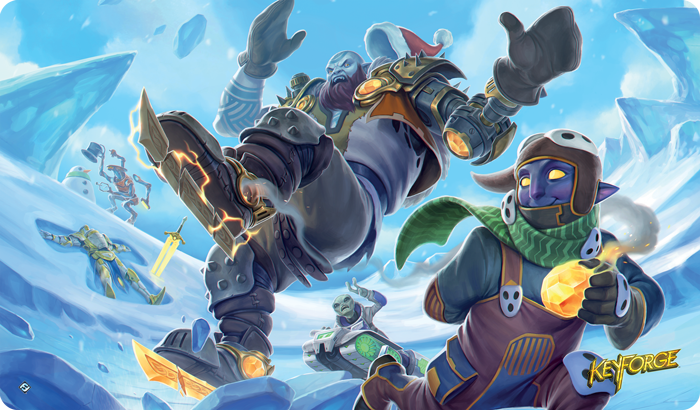 The Æmber Wonderland Playmat features characters from the world of KeyForge having some holiday fun in the snow. While the alliances between the various Houses of the Crucible are constantly shifting in endless clashes of wit and strength, this playmat brings everyone together for some holiday shenanigans! Snow men, sledding, snow angels, and ice skating are all classic holiday traditions, even on the Crucible… along with stealing some Æmber, of course! KeyForge is the world’s first Unique Deck Game, pitting truly unique decks against each other in a race to forge three keys. This 14” x 24” slip-resistant mat will keep your games of KeyForge organized while protecting them from errant clutter. Add some whimsy to your favorite card games with the Æmber Wonderland Playmat, available exclusively on our website for a limited time. Be sure to grab yours today and celebrate a world of infinite possibilities! Order the Æmber Wonderland Playmat (HOL03) through the Fantasy Flight Games website today!